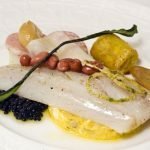 We were delighted when we were invited to visit and write a 21212 review because there’s always a certain level of excitement about visiting this Michelin starred restaurant. I can only put this down to it being trendier than other Michelin starred establishments, but don’t be put off if you’re more of a traditionalist, you’ll enjoy the experience just as much as a twenty-something. Chef Paul Kitching is known for his unique style of cooking and each dish contains a myriad of flavours. From the silky smoothness and intense flavours of the soup to the mouthwateringly succulent chicken and the exquisite dessert each course delicately dances across your taste buds before building to culinary pachyderm parade. Of course the menu contains all the refinements you’d expect from a Michelin starred restaurant, but Kitching’s sense of fun is peeking out from around the corner, with little additions such as milk infused with oats and the most delicate hint of cinnamon poured from an old fashion creamer (a china cow) as a palate cleanser. The high ceilings and modern decor combine with sumptuous banquettes and decadent twists to give a warm yet airy feel to the dining room, from where you can see through to the meticulous preparation in the kitchen. The overall experience justifies the anticipation of the event – true fine dining in the most exquisite of settings, this is a real favourite of ours! Browse more fine dining restaurants in Edinburgh here. Do you agree with our restaurant review score for 21212? Add your rating below!